Golden Valley, MN April 19, 2017—The Organic Acidemia Association has launched the largest-ever study to research rare organic acid disorders that cause multiple life threatening conditions. Currently there are no cures for organic acidemia disorders. 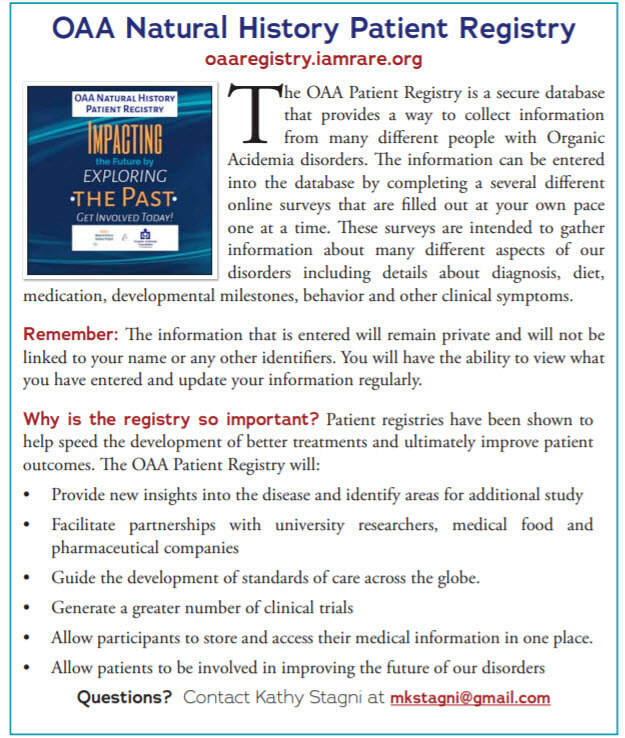 “The OAA Natural History Patient Registry will provide a complete picture of each patient’s experience with a variety of different organic acidemias,” said Kathy Stagni, Executive Director, Organic Acidemia Association (“OAA”). “We are launching this initiative to help fill the missing link researchers and medical experts need to advance research, improve treatment and discover a cure." To help drive awareness and participation, the Organic Acidemia Association will contact families who initially showed interest at the OAA family conference last year. Plans are to post to social media (Facebook and Twitter) to invite families to participate. 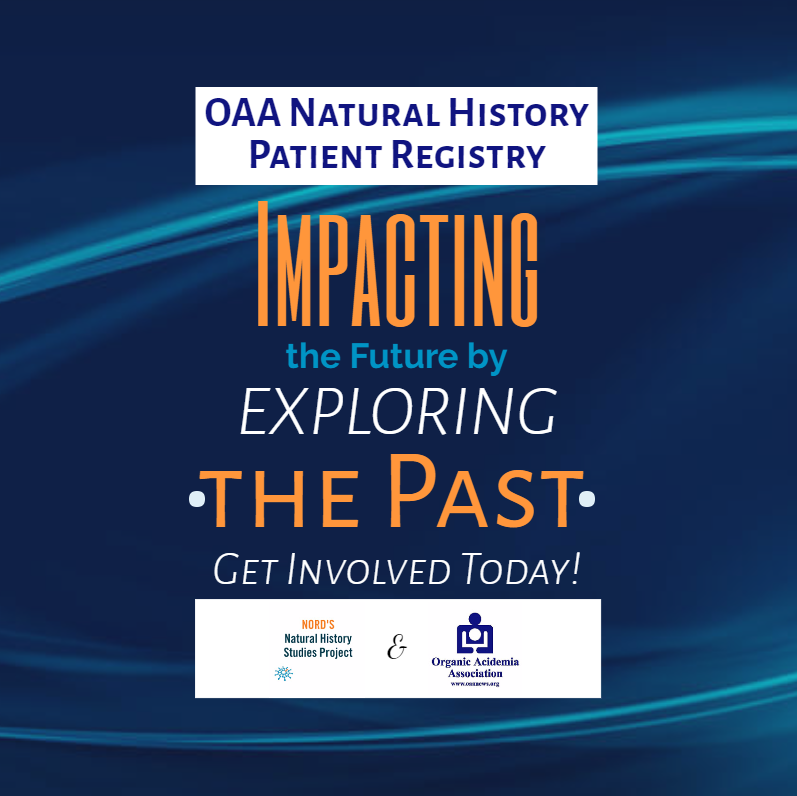 The OAA Patient Registry is a natural history study that consists of electronic surveys to collect information about the patient experience and disease progression. Patients, or their caregivers or guardians, can enter information from anywhere in the world. The data are anonymous and stored securely in an online portal called a registry. The Organic Acidemia Association may share the data but not personal identifying information with individuals or institutions conducting research or clinical trials, subject to approval by the study’s governing board that includes scientists, doctors and patient advocates. Organic Acidemias are a group of inheritable genetic metabolic disorders in which an essential enzyme that is necessary for protein metabolism is absent or malfunctioning. This defect results in a buildup of chemicals, usually acids, on one side of the metabolic blockage and a deficiency of vital chemicals on the other. This causes an over dosage of one chemical (often toxic) and a shortage of another which is essential to normal body functioning. An independent 501(c)(3) nonprofit organization, NORD is the leading advocacy organization representing all patients and families affected by rare diseases in the U.S. Established in 1983, NORD is committed to the identification, treatment and cure of the 7,000 rare diseases that affect 30 million Americans, or 1 in every 10 people, through programs of advocacy, education, research, and patient/family services. In addition to educational resources for patients, families, medical professionals and students available on its website (www.rarediseases.org), NORD represents 250 member organizations and collaborates with many others in specific causes of importance to the rare disease patient community. Click here to sign up for this important Registry! If you would like to volunteer to help with the registry - complete this form.